‘In recent times, if I had a day off I’d often go over to visit the Ma’ in Cabra West. Now she loved nothing more than to be sitting in the parlour looking out at the neighbours houses and people walking by and telling me stories from years ago. She’d be after telling me all about when she was a Young One living in the tenements and all the ghosts that haunted them places. Other times she’d talk about our old neighbours and how they all got to know each other when they first moved out to Cabra West. You see, there was no proper bus service or anything like that and most of Cabra West was still a gigantic building site with wild horses roaming around the place. So the Ma’ had loads of stories to tell me and I even managed to convince her to speak into a tape recorder and tell her stories. But I remember one day in particular when we were gawking out the parlour window and a woman passed by that used to play Skipping and Piggy Beds with one of my younger sisters, years ago of course. I said to the Ma’ “Is that who I think it is“? and she replied with “Yeah, that’s her alright, she’s another one that just appeared, you know”? Well now, I can tell you that a whole new avenue of conversation and thought opened up for me right there and then. Because, you see, there were a lot of young children and boys and girls I remember who seemed to just appear out of nowhere. One day my sister was playing Piggy Beds with some of her usual pals and another Young One. And I said to my sister “Who is she“? and she said “That’s me new pal, she lives in O’Connor’s (Name changed) house“. Now, I didn’t ever remember seeing Mrs O’Connor with a new baby and especially one that was almost eight years old. Another time in Finbar’s School the Teacher was calling out the Roll at ten o’clock one morning and he up and calls out “Jimmy Smith” and a little unknown voice answers “That’s me sir“. Now, that wasn’t the way to answer the roll call and all our heads swivelled to get a look at this strange voice and even stranger fella sitting up near the classroom door. He told us later on that he lived in town with his Granny and that she had a stall in Moore Street and that he came to school on the bus. 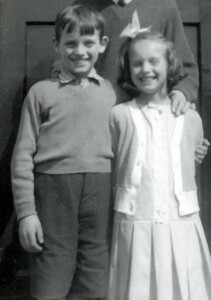 Other times there were boys and girls with English accents who just appeared on our road and started going to school with us as well, they never went back to England or that. There was one family in particular that the father went to England “looking for work” and came home a few years later with a set of twins belonging to his other woman and let them with his wife. My mother told me that there were other children in the area who were legally adopted. Some belonged to the “New Mammy’s” sister who may have died or was unable to manage.